THIS ITEM IS NOT ELIGIBLE FOR FREE SHIPPING. This product is not eligible for any additional discounts, coupon codes or promos. Recon is the newest addition to the Premier Series 5th wheel hitches in the HiJacker family. The Recon is built with the same quality and durability as the other Premier Series hitches. The Recon is a lighter weight geometric design that fits industry standard bed rails. The lighter weight design allows you to easily separate the hitch into two pieces making installation and removal quick and easy. 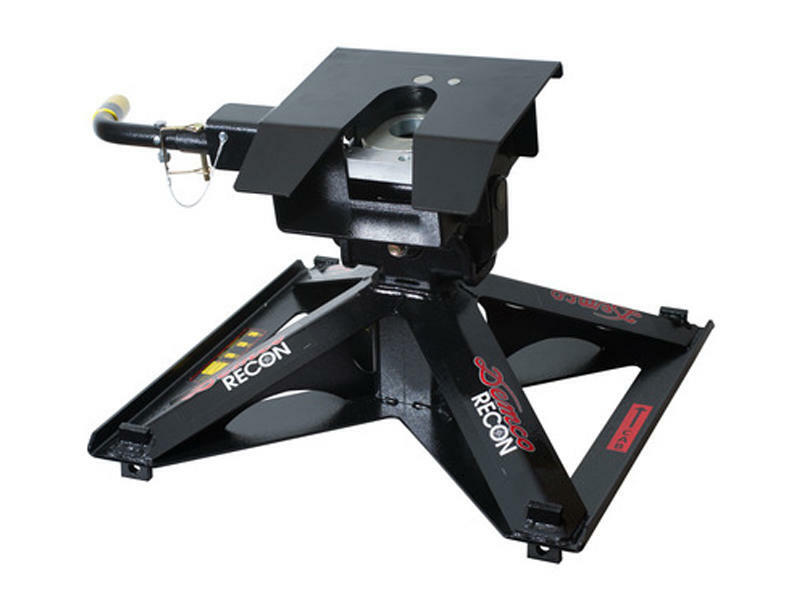 Because the Recon utilizes a standard 5th wheel head design, no adapter plates or pin box modifications are needed. Made in the USA!. You can follow this link to order your rails Rail Kit #30035. To make your installation even easier you may also want the Quick Install Brackets. Lighter weight, two piece design for easy install an removal in and out of your truck - Entire fifth wheel only weighs 123 lbs!! For nearly 50 years Demco has used the phrase “Doing our Best to Provide You the Best” to describe our commitment to customers, suppliers, co-workers and management in our ongoing quest for excellence. Since the beginning Demco has pursued a dream to fill needs, provide solutions, and compete in an existing marketplace. But, with a new generation and a new economical environment come new challenges to fulfill new dreams. Our new vision is not only to enter and sustain, but to flourish in today’s new ever-changing global marketplace. With our continued focus on family, team, quality and customer service, we will STRIVE to fulfill this vision with a firm conviction that our effort spent today will continue to bring rewards in the future. As a direct result of that conviction, Demco occupies a position of leadership in a specific segment of today’s global marketplace with a well defined line of quality products serving multiple needs world-wide. From Agriculture to Towing, from Brake manufacturing to Printing, Demco has earned its place with the right combination of skill and technology needed to produce the best products available without compromise. We enjoy long-term relationships with our clients and look forward to this continuum with our new clients.